With trick-or-treating behind us, it is time to turn our attention to the fast approaching Holiday season. During the Holiday it is easy to get carried away with spending, buying gifts for your family and friends, traveling, and purchasing food for Holiday feasts. It is such a season of giving that you may find that you leave yourself with very little to ring in the New Year. Recently, American spending and household credit card debt has been on the rise coinciding with a decrease in household savings. When your spouse really wants that Apple Watch or your kids need a new smart TV for their room, it may be hard to turn them down. 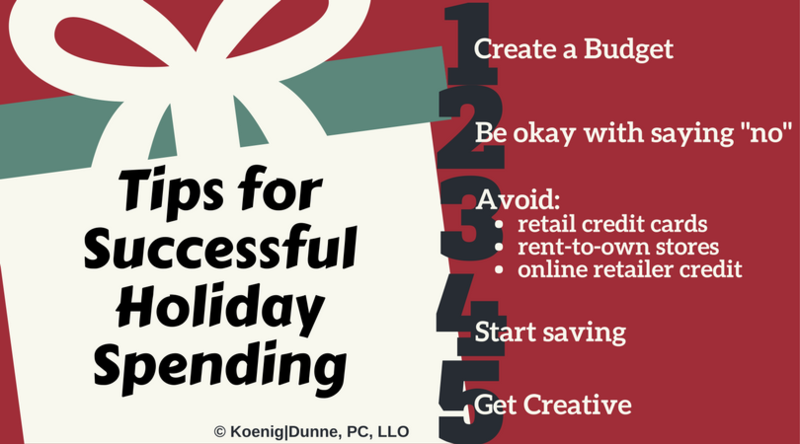 Instead of relying on a budget, you may put those purchases on an existing credit card or open up a new retail credit card to take advantage of the Holiday deals. In my experience, it may be the first time of the year that someone deeply reviews his or her finances and credit card debt accrued over the last 12 months. The realty may not be all that jolly and bright. Create a budget. Write it down and stick to it. Seeing how much you are planning to spend or have already spent will keep you focused. It is a lot harder to make that ultimate financial decision at the online check out without first having a plan and budget in place. Be okay with saying “no.” You might not be able to fulfill everyone’s wish list this year. Don’t feel as though you have an obligation to buy a gift for every friend and relative. In my family, we have decided that we will draw names for who will buy a gift for whom. That way everyone still receives a gift. Avoid retail credit cards. No matter how much GAP Cash or Kohls bucks are thrown your way, you need to avoid these high interest credit cards. You’ll be paying on that Xbox you buy your son with your Best Buy Credit card for way longer than had you just saved the money monthly and bought one without credit. Do not buy anything at a rent-to own store. That $500 TV may end up costing you up to five times that amount by the time you pay off the agreement. For a weekly payment of $50, you could have just saved for 10 weeks and purchased the same TV outright. Resist the urge to obtain credit through an online retailer. In recent years, I have seen an increase in clients owing places like Fingerhut for Christmas gifts they bought their children. You end up paying for those toys and tablets many times over if you ever pay off the debt in full. You may be catching a theme here. Start saving. It is never too early to start saving now for next year’s Holiday spending. Start setting aside an amount per paycheck or designate an amount from your tax refund that you will save for the next Holiday season. Get creative. There are other ways to express your gratitude for those you love. Create a special experience or take the time to personally make a gift. After all, it is the thought that counts. A gift does can cost as little as $0. I promise I am not trying to be a Scrooge. The Holiday are stressful enough. If you have a firm grasp and control of your finances, you take one stressor off your plate so that you can be okay with eating an extra one or twelve of Grandma’s chocolate chip cookies. If after reviewing your Holiday finances, you need some support and guidance, Koenig │Dunne can help you make the right decisions for a Happy New Year.